LAS VEGAS - Jeff Keeping is the new president of the CFL Players' Association. Keeping was elected to the post Friday night at the union's annual general meeting. The Winnipeg Blue Bombers centre had served on the executive as third vice-president and succeeds Scott Flory as union head. Flory came under fire following the last round of collective bargaining in 2014 that saw the union abandon its proposals on revenue sharing and player safety. While the players agreed to an increased salary cap of $5 million from $4.4 million, they also accepted annual cap increases of $50,000 over the five-year agreement. Marwan Hage, a retired offensive lineman and the former second vice-president, moves up to first vice-president, replacing Jay McNeil. Also joining the executive are defensive back Keon Raymond (second vice-president) and offensive lineman Josh Bourke (third vice-president), both of the Toronto Argonauts. 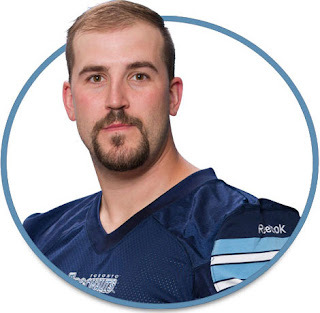 Also, veteran Hamilton offensive lineman Peter Dyakowski becomes the union treasurer. Brian Ramsay, an offensive lineman with the Edmonton Eskimos, has also been hired as the new executive director. ``First, I would like to thank Scott and Jay for their tenure and diligent work on behalf of the Association,'' Keeping said in a statement. ``The newly elected executive brings valuable experience and leadership qualities from serving as long-time player representatives. The CFLPA also made constitutional and bylaw changes, including the provision that should the entire executive committee be voted in as nationals or internationals, a fourth vice-president's position of the opposite designation would be activated. This proposal didn't apply to this year's election as Raymond, an international player, was elected. Good move, but a little too late after that neg. fiasco with the league led by Flory. Looks like the CFLPA has taken some big steps forward and have a very capable group of people looking out for their members interest going forward. Look forward to hearing from the new pres soon on the Sports Cage! Its about time that the CFLPA recognized that the existing personal was Farr too focused on what was best for the national players and excluding the rookie international players completely. We all know that finding new talent for this league is important. As long as they continue to pay a rookie $55K Canadian dollars which is approx $38K in US Dollars. That is a complete joke. You can't even live on that amount of money up here. Having to home yourself. What is left over to send back to their family... NOTHING! So until this league starts to pay better across the board. Instead of the QB and 4 or 5 other players on the team eating up the majority of the salary cap. The CFL will continue to be looked down upon. There is nothing there right now that states this league has a chance to get better and grow. Other than a few new stadiums being built. Even some of those stadiums had to be funded by private donations. I love CFL football so I hope this new team in charge of the CFLPA will make the right adjustments. On another note I want to go on record to state that the league has hired the wring man as the Commissioner!!!! He has zero personality. He is invisible and in fact I can't even remember his name. That's how bad he really is. Say what you will about Mark Cohon. He was 10 times the man that this new American Commissioner is. The hew old CFL logo is terrible. That's just the start. All the numbers in the league are down since Mark left. Even in the NFL the QB and 4 or 5 players eat up the majority of the salary cap space. What separates the NFL from the CFL is that the salary cap for one NFL team is more than double what the cap is for the entire CFL. Seriously how much do the posters on here make? Most of Saskatchewan averages about $28000. Few can afford games. That means a lot of money is being spent on the riders by a wealthy few. Sharing has lost all meaning in this province. What the hell does "" Sharing has lost all meaning in this province ""
have to do with this article. Or money being spent on the SK Riders? Nothing! This article is about the Canadian Football League Players association. Nothing to do with the Riders or SK at all! Maybe stick to the subject at hand. Your comments mean absolutely nothing to this article! Did you even read it? I'm at a loss for words to express how stupid the above comment is. So only the wealthiest 33K people go to Rider games? What about the family section? What about the student section? The whiney stupid, poor and lazy complaining that they deserve things they haven't worked for, expecting those who have to pay for them. So 'Forked tongue Flory' got his needings. That is interesting you call Flory out given the disaster he inherited from Morreale. The real work regarding the last CBA wasn't done (or even started for that matter) until Flory took over because Morreale and the former lawyer Molstad did absolutely zero preparation for it. Flory also turned the CFLPA around from a low 6 figure deficit (thanks to Morreale's free spending) to a mid 6 figure profit organization in two years. Maybe you should get your head out of your own back-end and try and understand what really happened before commenting as idiotically as you did. You have no clue. Cohon walked all over Flory it was pathetic.